Mazoori is a human rights defender with extensive experience in Afghanistan and Australia. In 2001, Mazoori fled persecution by the Taliban in Afghanistan and sought asylum in Australia, where he became an active member of the Afghan refugee community. In Australia, he worked interchangeably as an interpreter, refugee youth worker, and client support coordinator with children in immigration detention and out in the community. He has also served as president of an Afghan community association and in 2008 was inducted into the Victorian Refugee Recognition Record (VRRR) for his outstanding contribution to the Afghan community and to the State of Victoria. 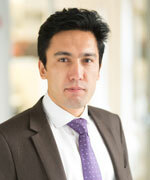 In 2008, motivated by his past experiences of persecution, Mazoori returned to Afghanistan to pursue human rights work. He spent two years working as a translator at the Afghanistan Independent Human Rights Commission, specializing in transitional justice. For the next three years, Mazoori consulted for PHR as the Afghanistan program assistant, facilitating the five-week Paraprofessional Mass Grave Site Team and Basic Human Osteology Training conducted in 2010 at the Afghan National Police Academy. He also worked on PHR’s 2013 report, Securing Afghanistan’s Past: Human Remains Identification Needs and Gap Analysis. He is a board member and one of the founders of the Afghanistan Forensic Science Organization, the first non-governmental forensic science organization in Afghanistan, as well as a founding member of the Transitional Justice Coordination Group, a network of civil society and victims’ groups active in the area of transitional justice. Mazoori holds a diploma in interpreting from the Royal Melbourne Institute of Technology. He is fluent in Dari, Hazaragi, and Farsi, and has working knowledge of Pashto.